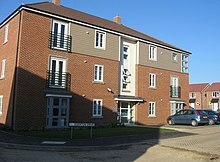 A medium-density development, in the United Kingdom. Typical features are the apartments in a multi-storey (but not high-rise) building. Medium-density housing is residential developments that are at higher densities than standard low-density, (or 'broadhectare') suburban subdivisions, but not so high that they might be regarded as high density housing. In Australia the density of standard suburban residential areas has traditionally been between 8-15 dwellings per hectare. Medium density housing can range from about 25 to 80 dwellings per hectare, though most commonly the density is between 30 and 40 dwellings/hectare. Such developments may consist of detached, semi-attached and attached (or multi-unit) housing. Many traditional types of housing developed prior to car-based cities were at comparable densities, such as the terraced (row) or courtyard housing found in many parts of the world. The inner suburbs in many Australian cities and those activity centres developed during the late Victorian suburban boom have examples of medium density housing. Since the 1960s, many Australian states have encouraged urban consolidation policies which have facilitated the construction of medium density housing. The design of medium density housing requires careful consideration of urban design principles. In some cases, urban consolidation policies have allowed indiscriminate demolition of existing low-density housing across established residential suburbs, replacing them with various forms of medium density dwellings. Because of this, many medium density developments have been controversial in the last 20–30 years because of their perceived negative impacts on the neighbourhood character of established residential areas. Accordingly, there has been an increasing policy emphasis by state and local governments to regulate the design of new medium density developments, such as the Victorian government's ResCode, released in 2001, and the metropolitan strategy, Melbourne 2030, which seeks to confine such housing to activity centres.